This article is about the minigame from Mario Party 5. For the minigame of the same name from Mario Party 7, see Shock Absorbers (Mario Party 7). 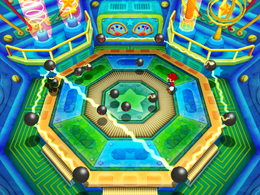 Shock Absorbers is a duel minigame found in Mario Party 5. Its name is a pun on shock absorbers, mechanical devices meant to soften jolts, typically associated with cars and other vehicles. The concept here is comparable to the one in Amplifried, a minigame from Mario Party Advance. Various Amps appear inside a circle of more Amps. Players attempt to avoid being shocked by the Amps as they arbitrarily bounce along the circle. The Amps periodically shoot deadly bolts between themselves, which must be avoided. This attack can be detected early by watching which Amps stop and glow. Two of the outer Amps and one in the middle stop and glow before shooting the electricity between themselves. A player loses if an Amp or beam of electricity is touched. Rules – "Avoid the Amps, and don't let yourself get shocked by the electricity flowing between them. Whoever lasts the longest wins." Advice 1 – "The Amps fly around and ricochet off of each other and the walls, so stay alert!" Advice 2 – "The Amps flash when they are about to shoot a bolt of energy. Keep moving around, and look out for the bolts of energy." This page was last edited on December 16, 2017, at 09:34.